Riverside Place office building by Miller & Favazzo Properties - quality real estate development and property management. Developed in the mid 1980s, this 273,000 SF office building was one of the first new buildings in the redevelopment of the East Cambridge office market. Designed by the Stubbins Associates, the façade consists of warm red brick, consistent with the scale and finish of other buildings in Cambridge. The complex also includes a riverfront park and elevated landscaped plaza, decorated with modern sculpture. 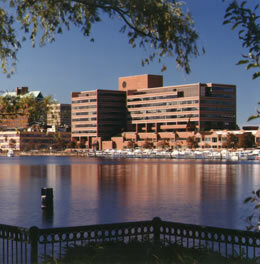 Riverside Place originally served as the headquarters for Lotus Development Corporation and has recently been occupied by IBM.